When: Thursday July 7, 2016, 7:30–8:30pm. Where: Blue Moon building, corner of 39th and (3820) East Lake. Upstairs. Entrance just west of the Blue Moon coffee house; up the stairs and to the left. Not wheel-chair accessible. Plentiful street parking. Best to arrive 10-20 minutes early to get coffee and food/dessert from the Blue Moon, and to be seated by 7:30 so we can begin on time. And, the venue will easily hold about 30; after that, standing or floor-sitting room only. The early bird gets the seat. Please occupy the close seats first. Be an up-front person. Special Song Prelude 6:45-7:15 Jess and John Wenstrom have been playing and singing country and Appalachian songs together for as long as Jess can remember (John being Jess’s dad). Their current name for their band is 39 Brackets. Before and after: The Blue Moon, downstairs, has coffee, sandwiches, desserts. Merlin’s Rest, a bar/restaurant 3 blocks west, has a full bar, good food, a late hours kitchen, reserved seating..
THURSDAY April 9, 2015 at 7 p.m.
and every one of you readers for making this Blond Boy reading a huge success! 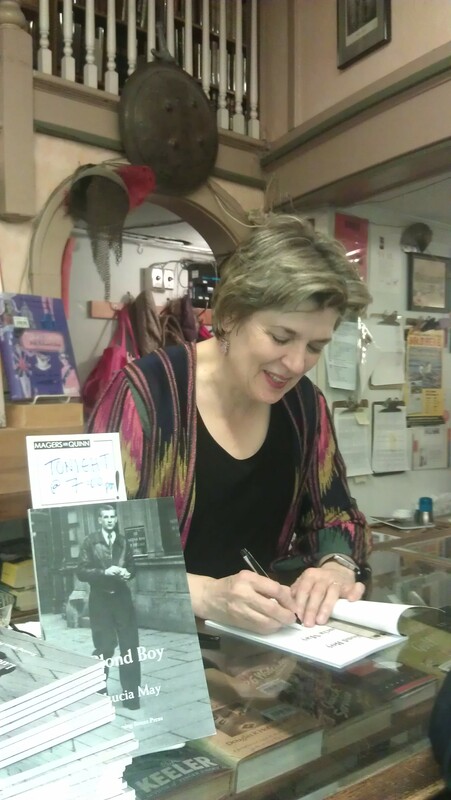 The evening exceeded our expectations in every way! 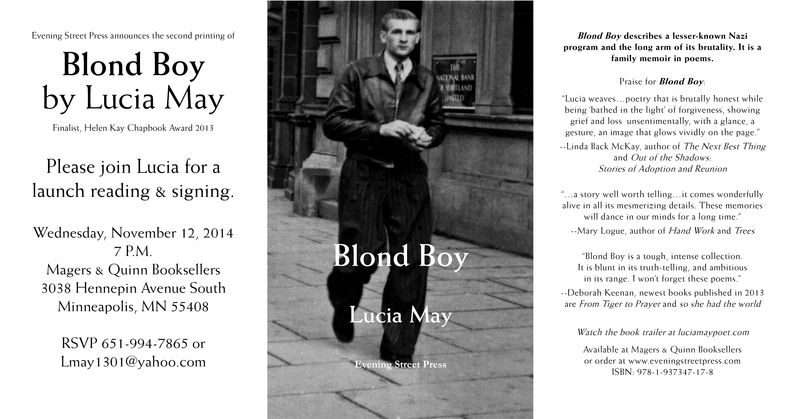 Please join me for the Blond Boy launch reading at Magers & Quinn on Wednesday, Nov. 12, 2014, 7 p.m! Scroll down their events page here for details. Blond Boy is now in its second printing! Thanks to all of you who are making this possible. Also, check out my Readings page update. Please watch this evocative book trailer by Jon Engman. (link to book trailer) The woman singing is my grandmother, Bronisława, Lucian’s mother, in the village Orenice in central Poland in 1971. 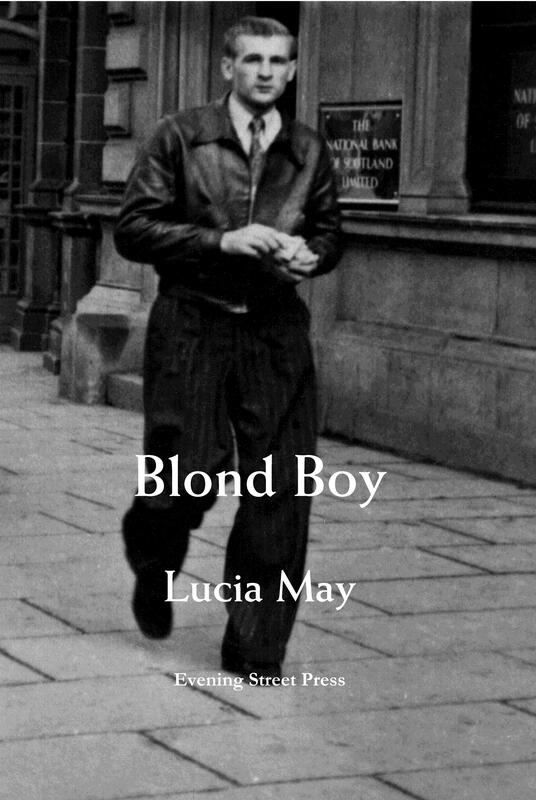 Blond Boy is available from Amazon.com and from Evening Street Press or by calling Evening Street Press at 614-937-2124. Blond Boy describes a lesser-known Nazi program and the long arm of its brutality. 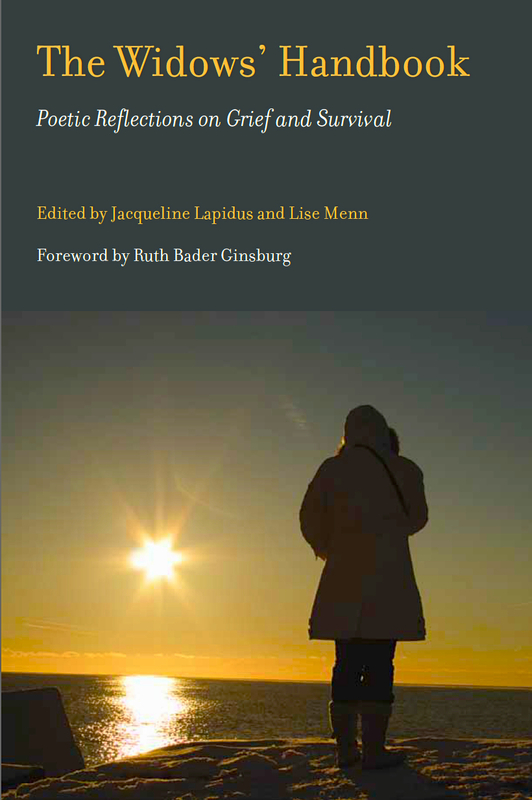 It is a family memoir in poems.